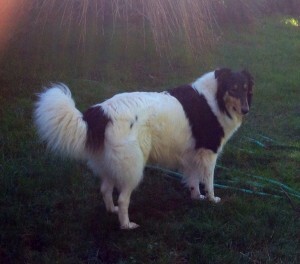 Clover is a laid-back farmcollie who can step it up to get the job done. Clover has worked with sheep, chickens, and ducks. She makes the stock notice and respect her using posture, selective barking, air-snaps and ankle nips to get her point across when needed, yet she is also capable of gentle herding of smaller livestock. She is protective of her handler, guarding their back enthusiastically when stock are being pushy. When not herding, Clover is excellent with baby animals and able to walk right up to interact with stock. She patrols occasionally, but prefers to monitor the property using a vantage point that she can easily spring into action from. She will announce visitors with barking, but stops and changes to greeting when they exit their car. She announces and repels predators with fierce barking and rushing. Clover hunts rodents by sight, following rustling in the grass and often eating her kills. She will bark to chase larger animal visitors off.